If your young athletes are easily distracted by people shouting on the sidelines, if they are obsessing over their mistakes, or if they worry about what people think of them–their concentration and performance will suffer. How well your kids focus and what they focus on can make or break your athlete’s experience in sports. As sports parents and coaches, you influence what your sports kids focus on. You might unknowingly distract your athletes by attempting to over coach them prior to games, yelling from the sidelines, or focusing them on statistics or outcomes. These outer distractions can hurt your young athlete’s performance, not to mention the numerous inner distractions they harbor in their minds during competition. Young athletes tell us they struggle with many of these distractions. Their parents and coaches also report this about their young athletes. Focusing on the right things in sports is a skill that can be learned. You can help your young athletes learn how to refocus when they’re distracted. They can learn how to focus their best in competition in order to improve their consistency and performance. Confident, successful young athletes know how to focus and what to focus on. They understand what “cues” they need to concentrate on. They understand what distracts them and can quickly identify when they’re distracted. What’s more, they can quickly get back on track so they don’t skip a beat. They know how to “get in the zone,” and spend more time in the zone, feeling “on,” relaxed, and immersed in the process of performing. When they’re in this state, they’re not easily distracted. They can easy to concentrate on what’s most important to their performance. We designed this new program, specifically for young athletes and their parents or coaches, to help athletes concentrate on what’s important so they can perform their best. It’s the culmination of years of research into what distracts kids in youth sports, how distractions hurt them, and what helps them focus at peak levels. In addition, we help parents and coaches identify how they distract athletes and teach you how to help your kids focus. It also helps your young athletes identify how they get distracted and teaches them mental skills to stay focused on the right things so they have fun and make the most of their physical talent. First, the program includes a workbook and CD for young athletes, which walks them through seven simple lessons in mental focus in sports. Second, the program includes a manual and CD for parents/coaches that provides mental game tips especially designed for parents and coaches. You’ll also learn about how you might distract your young athletes and how this hurts their game; and how to behave before competitions to give your athletes the mental advantage. Kids learn mental strategies for better concentration so they can focus and excel. Young athletes discover why focus is so critical and find out how to identify their distractions. They discover what they should be focusing on in their sport—specific “performance cues,” or thoughts, feelings, targets or images related to their sport. Most importantly, the program teaches them strategies to help them quickly re-focus when they are distracted. We even provide specific suggestions aimed at helping you communicate to your kids in ways that enhance their focus and confidence (As sports parents ourselves, we understand that it’s not always easy communicating with young athletes about sports when everyone feels so passionate about it!). Try It Out–Download a Free Chapter! Read Day 1 of Kids’ Workbook – FREE! We want to help as many athletes as possible. That’s why we’re giving you the introduction and first chapter to the kids’ workbook – absolutely free! Download this now so your athletes can complete The Focused Sports Kid Assessment today, no obligation! AND FIRST CHAPTER (on PDF) NOW! Working with some of the top athletes in the world, including PGA Tour winners and NASCAR winners, on techniques to improve confidence, focus, and composure for sports for over 20 years. Authoring and producing an extensive library of sports psychology books, videos, audio programs and training seminars. (Visit Peaksports.com Mental Training Proshop or sports psychology seminar page for details). Lisa Cohn is an award- winning parenting writer and seasoned sports mom. Lisa has been quoted by the Associated Press, Washington Post, Christian Science Monitor and Seattle Times and has appeared on ABC Radio Network’s “Satellite Sisters” and many nationally syndicated radio shows. She’s the host of Ultimate Sports Parent Radio, a podcast series which has more than 150,000 subscribers. “The Focused Sports Kid” is two programs in one. There’s a manual and CD for parents/coaches, and a workbook/CD for young athletes. In addition to learning how to identify their distractions and deal with them, young athletes learn about how and why to focus on sports-specific “performance cues” that will help them feel more confident and excel in sports. Parents/coaches also learn about these all-important performance cues and why they should help kids focus on them. The sports kids’ workbook is an easy-to-understand, illustrated, step-by-step workbook for young athletes, age 8 to 18. It tells kids why focus is so critical, and guides them through the process of identifying their distractions so they can focus on the things that will allow them to excel. We provide many sport-specific examples of the performance cues kids should be concentrating on—the thoughts, feelings, targets, images or communication related to their sport. The program also explains how to set mini-goals to play in the present, and how to establish a warm-up routine. This CD guides young athletes through 7 days’ of exercises that will help them boost their focus, confidence and success in sports. Your kids listen to the CD and then complete the workbook exercise in each of the 7 days. The CD walks them through the workbook and provide additional tips or examples on how to complete it. A training manual that teaches parents and coaches how to communicate and support their young athletes in ways that improve their focus, confidence and success. We even provide sample sentences that will help you communicate better with your young athletes. Parents learn what not to do—and how to change their behavior, if needed, to ensure kids hone their focus and experience happiness and success in sports as a result. This audio program guides parents through each of the seven days and provides examples of how parents can help their kids complete the daily exercises to ensure their kids refocus after distractions and make the most of their sports experience. Refocusing after distractions means your kids can get the most our of their performance—in practice and competition! Day 7: Advanced Focusing Strategies (including how to create mini-goals that help kids focus on the here-and now). Warm-up – An introduction to get kids ready for the upcoming lesson. Today’s Mission – The overall mission for today’s lesson. Athletes’ Worksheet – Specific exercises your athletes complete to boost their confidence. Things to Talk About – Discussion questions to talk about with a parent or coach. Today’s Practice – Tips for how to apply today’s strategies in practice. What Did You Notice? – A short section asking kids to assess how well they implemented the mental strategy into today’s practice. We reward people who take action. Including $75 value in bonus programs (see below), you can purchase the CD for kids, the workbook for kids, the CD for parents, and the manual for parents and coaches for only $97.00 ($87.00 for the digital download version–save $10 and no shipping cost!). What If I Want to Provide the Program for My Entire Team? We’ve also added a third option to The Focused Sports Kid. You can purchase the program and receive access to the Digital Version, which you can share with as many as 20 people associated with your team. This option will increase your whole team’s ability to focus, leading to better performances in competition. As a bonus, we’ll also ship to you one copy of the actual program workbooks and CDs. Some athletes are born with excellent concentration powers and do not have to work at it. However, other athletes must work at improving their focusing ability and concentrating with distractions. In this special report, you learn how to use the most popular practice drills to improve your concentration for sports. Download this Adobe PDF report now your kids can begin to work on sharpening their concentration skills while you wait for “The Focused Sports Kid” to arrive if you ordered via mail. Preshot or what we also call “get ready to perform” routines can help your kids avoid making mental goof-ups. A preshot, preserve, or prekick routine is a series of thoughts or movements that athletes complete over and over, before each shot, serve, throw, or kick. If your kids develop routines–such as bouncing the ball before a free- throw in basketball– they’re more likely to focus on the right cues! “The Focused Sports Kid” post-performance assessment helps your athletes assess their mental game and focus after each performance by asking them important questions. You’ll want this bonus to help your kids assess their own mental game based on the strategies they’ve learned in The Focused Sports Kid. Then you can help your athletes make any adjustments based on their own self-assessment. 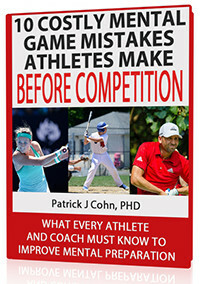 Athletes sometimes forget the important lessons they learned as they prepare for competition. For this reason, we have created a summary of the top focusing strategies. A quick and easy way for kids to remember their focusing skills without a parent having to nag them prior to competition. Great to review on the way to tournaments, performances, or games! We’ll assume all the risk to make this a no-brainer for you. We’re so confident that you will love our new program that we offer a 100% SATISFACTION GUARANTEE. If you don’t like the program–for any reason at all, ship it back for a full refund within 30 days of your purchase date. No questions asked. And you keep the bonuses! CDs and Workbooks – shipped to you via USPS. Digital Download – MP3 Audio Files and PDF Workbooks Only. Save $10 plus NO Shipping Costs! Great for international customers! Team License: Share the digital program with your entire team up to 20 members. You also receive one copy of the CDs and workbooks. When you click “Order Now” below, you’ll be taken to an order page where you can customize your order and secure your copy – just have a valid credit or debit card handy for your order. You can also use PayPal for your purchase. Thanks for spending the time to read about “The Focused Sports Kid” CD and Workbook program. It’s the best investment you’ll ever make to help your athletes boost their focus, refocus after making mistakes, and mentally prepare to cope with common distractions. p.s. You can download the bonuses right away after purchase and begin learning while you wait for your CDs and workbooks to arrive via mail. If you order the digital version, you’ll get access to the entire program on PDF and MP3 immediately! Customize your order now.